"Continue PROM (passive range of motion) and leash walks. Initiate stair climbing or swimming or both. Progress by increasing length of time for walking, swimming or stair climbing." I started letting Bruno jump into the car instead of lifting him in. He seems to have no problem with it. Bruno is still leashed 100% of the time when outside. When we walk into the woods he wants to take off running very badly to hunt around, but we hold him back. He is not allowed to run yet. It's a good mental exercise for him to have to heel instead of hunt in an area he is used to hunting. Soon, Bruno, soon. Just not yet buddy. 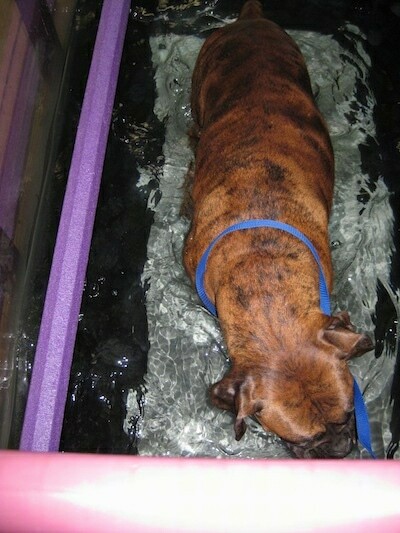 Bruno had his underwater treadmill therapy today. 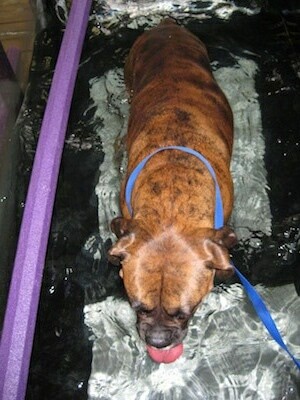 This time they worked on strengthening the muscles as opposed to the use of the leg in general. 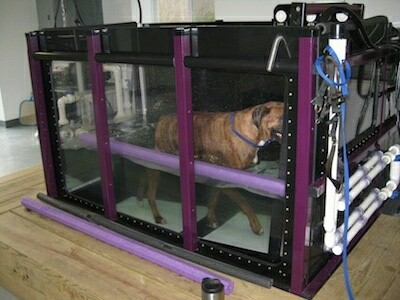 "Bruno walked at an incline at 1.9 mph for 20 minutes in the underwater treadmill. 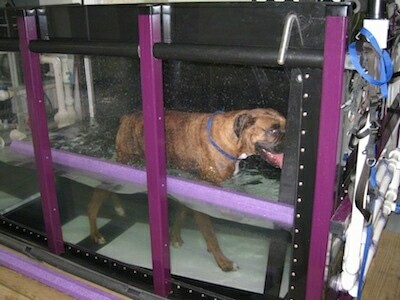 He is using the leg 100% of the time on land and 100% of the time in the treadmill." 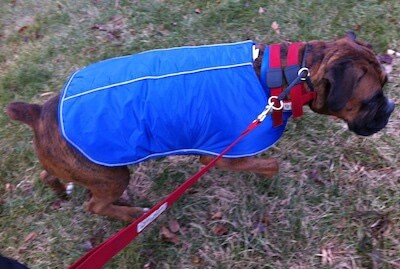 After every therapy session Bruno always has to pee big time. Just as I was picturing, he drinks the water while he is walking. Does that water taste good, Bruno? Bruno is always very happy to get to the vet's office. He loves the staff and seems to like his therapy. 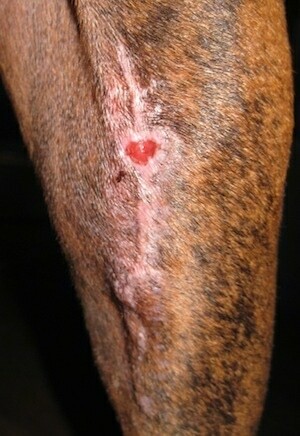 Bruno's incision wound on day 30. He is doing a good job at keeping it clean. 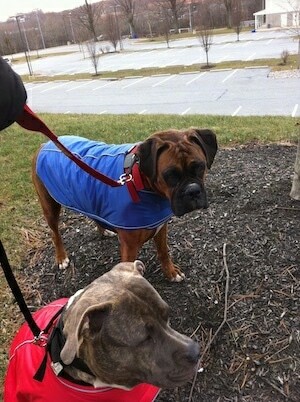 We continue to seek out hills on our walks to help strengthen Bruno's leg. He does well on long walks but if our pace is too fast he will stumble a bit. That tells me he definitely is not ready to run. 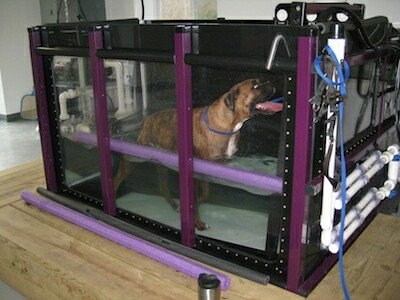 Bruno's water therapy report states, "Bruno walked at 1.6 - 1.7 mph for 20 minutes at an incline. He walked with the jets which provided resistance for ten minutes total. Bruno has made significant progress, and I look forward to working with him in the future. 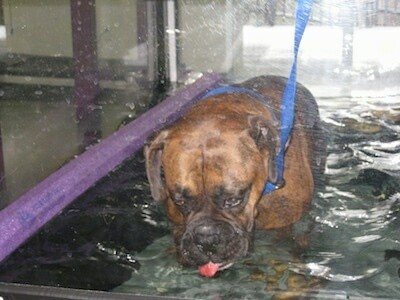 The plan is to swim Bruno once a week." 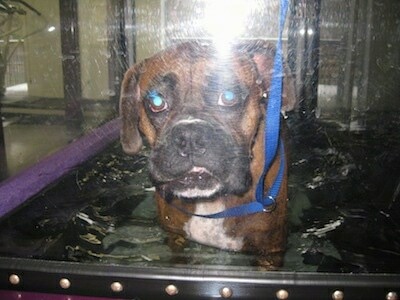 Bruno's water therapy report says, "Bruno walked at 1.6 - 1.7 mph for 20 minutes at an incline. He walked with the jets which provided resistance for 10 minutes total. Bruno has made significant progress, and I look forward to working with him in the future."